If a man covers his torso with a camisa, then a zupon, and then a toga, with what should he clothe his legs and feet? A simple glance at paintings of the time makes it clear: he wears what we often call joined hosen, and over that a limited variety of shoes. Newton writes, "in 1492 [in Venice] and all over Europe, men wore long hose which fitted over their feet and rose to the waist, round which they were tied at intervals to the zupon or corresponding short garment." Even "under the gown the togati were required to wear ordinary black hose." Newton speculates on the construction of hosen, saying that "the word calce referred to long tight stockings, joined at the crutch whence a triangular gusset was set into the back to ensure freedom of movement." I doubt her theory that a gusset was used to achieve the distinct seam line of Italian Renaissance joined hosen, but agree when she asserts that "paintings and sculpture of the time that show men of fashion show that they must have insisted on well-made hose that fitted closely." The young man on the left has decorated stockings, most likely pieced of three different fabrics, while the man on the right has solid colored ones. Both fit very closely, only creasing slightly at the knee, and rise high enough that even with the high-cut split at the side of the second youth's zupon, no hint of shirt peaks through. The first youth wears round-toed slipper-like shoes with a low back, like a low-soled clog, while the second has form-fitting boots that rise to mid-calf and turn down with a decorative fringe. Only the gondolier on the left, wearing brown, shows any shirt between his zupon and hosen, and there it is so regularly pointed that the gaps seem intended as decorative effect, rather like those down the center of his torso and on his arms. The hosen are cut in so form-fitting a manner as to cleave quite close to the male form throughout the legs and buttocks. In order for hosen to be cut this tightly and yet not bind the legs of the wearer, they must be precisely tailored through the crotch. The shoes, when visible, seem very low cut, especially around the ankle, and closely follow the form of the foot. 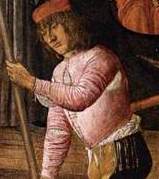 This gondolier (right and below) has his hosen firmly pointed to his doublet in front, where the garment is longer and rides lower on the torso, but has loosed the ties in back to allow him freer movement (especially bending at the waist) and now his full shirt shows through the resulting gap. The decoration on the hosen (which I must wonder about: was it embroidery? silk painting?) of these two gondoliers makes their codpieces slightly more visible. Both codpieces, while apparently padded, do not seem as pronounced or (dare I judge?) comically shaped as later sixteenth century fashions. The padding tends to point down and out, rather in the shape of a short, pudgy nose. Both also seem narrow, as the pattern of the legs of the hosen continues uninterrupted deep into the crease between the legs. Yet there is no hint of a gap here which might show shirt or other underclothes. While this is art, and therefore imperfections can be glossed over, I also suspect that such a style requires at least one set of points behind the codpiece, joining the two halves of the hosen. Their shoes are clearly visible and obviously both form-fitting and flexible, as both men are shown with their feet bending. 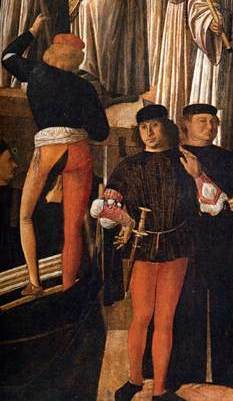 The soldier in the rear (right) seems to have untied the back points of his hosen and bent forward, pulling his shirt somewhat out of his hosen and allowing it to swell over the top edge of that garment now that he is again erect. 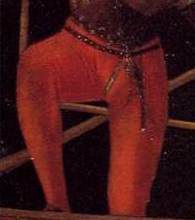 The soldier in front shows clearly the seam down the middle and bottom of the codpiece, which appears to be attached quite far back between his legs. Despite its prominence in this view, the codpiece still is modestly padded and shaped more to cover the groin than to draw attention to it. 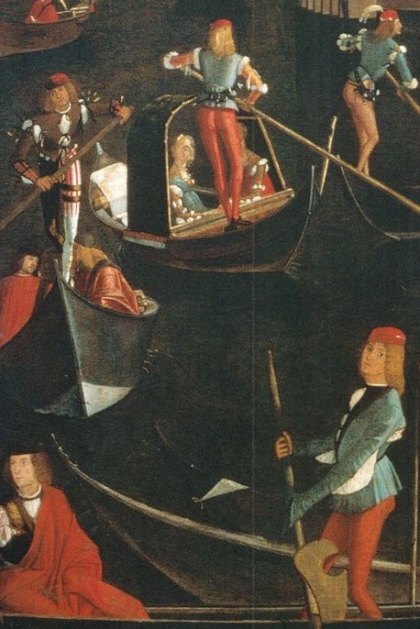 The man depicted is not supposed to be a Venetian, but a Hun, attacking and slaughtering Saint Ursula and her ladies. 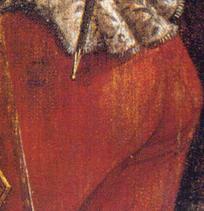 However, he is painted in great detail and his hosen have the characteristic Italianate inverted "V" over the tailbone. This scene depicts several men and a boy with hosen, many with stockings in stripes or legs of two different colors. Since this painting is of a formal occasion it seems likely that members of the Company of the Stocking might be present. However, there does not seem to be any consistent set of stocking color or design combinations which would hint at a group of young men all belonging to the same theatrical group. While most young men wear low-cut shoes much like those of the gondoliers, at least one has on boots that cover his calves. Here another group of gondoliers (left) show, by the short cut of the zupon and the lack of any white shirt around the waist, how high the hosen must be cut and how snuggly they must be pointed to the torso covering. 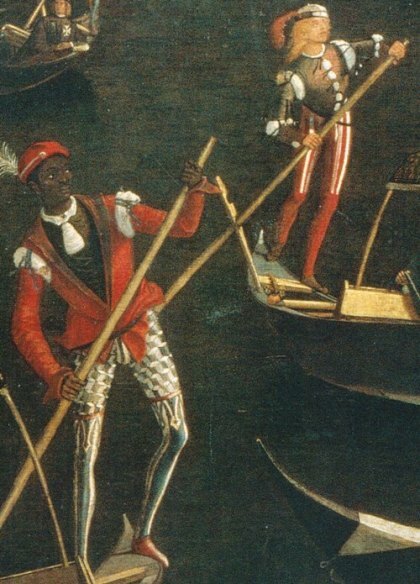 This gondolier's zupon (right) so completely covers his shirt at his waist that I might guess that the points that hold up his hosen are laced through an inside layer, such as a canvas lacing strip. Also, there are no visible eyelets or points. The codpiece shown here is similar to the ones above: not overly padded or pronounced, with a general downward slope and rounded form, and without any clear evidence of a wide flat flap behind it or of visible points to hold the codpiece onto the hosen. 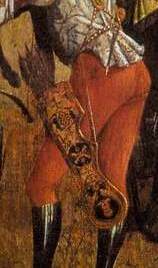 A useful side view of a similar codpiece is on the man below (far left image, red hosen, black belt). This gondolier's particolored hosen (left) show dramatically the stitching line at the back of the leg, and how in the center of the back at the seam that joins the two legs, that line ends over the tailbone and not quite at the top of the hosen. In the same image, the man on the right is wearing shoes that have broad, round toes and low-cut backs, like clogs. These could have rigid wooden soles, as it would be easy to slip this shape onto the foot. 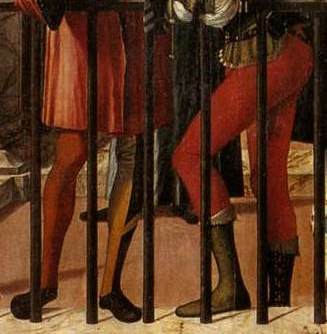 This person (right), presumably a young noble because of the rich brocade of his zupon, also has multicolored hosen. The black portions angle into the center over his tailbone, much like those of the gondolier referenced above. This image (far left) from a German altar shows hosen much like those in the Venetian images, with a clear inverted "V" over the tailbone. These shoes also do not resemble those in Venetian paintings of the 1490s-1500s. This earlier German image (left) shows the same seam lines as the Italian style. These shoes do not look like any I have seen in Venetian paintings of the 1490s-1500s. a codpiece not attached to a wide flap that anchors well below the doublet, like the hosen cited above, but narrow and anchored near the top of the hosen where the points can be concealed under the zupon. I began by tracing out the pattern diagrammed in The King's Servants to make my first pair of hosen out of linen. The linen wrinkled and bagged horribly at the knees and ankles, since it had to be made loose enough to put on (the fabric was not very stretchy, even cut on the bias). I made my second pair out of knitted wool fabric, which turned out to be disastrously baggy as they stretched with wear. However, the shape of the second codpiece was an improvement over the first attempt. My third pair will be bias cut out of woven wool, with the back seam and the codpiece adjusted to better match my current concept, and much tighter than the previous versions. Note: although I have not purchased nor read this pattern, Reconstructing History sells a 15th Century Hosen pattern that includes "Italianate slanted back seams." I have not found any additional patterns referencing this distinct Italian feature, but this could also be due to the small number of hosen patterns of any sort that I can find. Although I have altered the pattern to better meet my currently understanding of both good fit and the Italian cut of calce, I have yet to complete a pair of black wool hosen. I hope to finish this project in the near future. Although she does not support this statement with quotations from the diaries, Newton asserts that "under the gown the togati were required to wear...on their feet whatever the weather, zoccoli, sandal-like shoes with thick wooden soles, very familiar from Burgundian paintings of the middle of the fifteenth century and suitable for Venice's frequently flood-washed lanes." 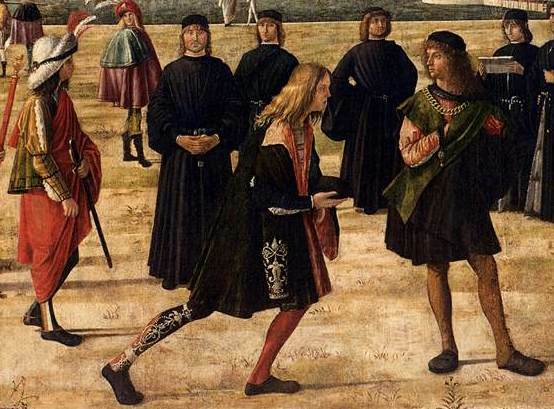 I am not well schooled in Burgundian art, but my cursory perusal of the style shows me shoes that do not seem identical to those in Venetian paintings, as they often seem to depict a longer, more pointed toe. The shoes I see depicted on the gondoliers and young Venetian men appear neither sandal-like nor thick-soled. Some shoes seem to be hardly more than form-fitting leather socks. Others lend a clear shape to the foot, a rounded toe that seems much like a clog to me. However even these shoes, while they could have solid wooden soles, must not always be made so, else they would not flex as they do on the foot of this running gentleman (below). The shoes of the togati are almost always obscured by the hems of their vesta. All I can detect of the footwear these gentlemen possess (right) is that the toes are somewhat rounded, and the shoes are black. From what I can see here, the shoe of the togati (furthest left, under the brocade vesta) is not different from that of the young men (middle and right). Sanudo wrote about rules governing mourning attire in his Città di Venetia. 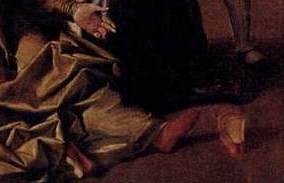 "The bereaved, he says, wears slippers on his feet (these were in contrast to the zoccoli normally worn and must have been deliberately allowed as noiseless)." The shoe that has fallen off of this woman's foot appears slipper-like, as it has a light colored lining that hints to me of a cloth upper. The gentleman behind her, though unfortunately shadowed, displays a shoe with a dark color toe and side, but a open area on the top of the foot and a narrow strap that probably closes with a buckle; perhaps it is shoes of this style that Newton compares to sandals. If so, I lack evidence for their construction within my target period, as this painting is from 1505 or later. I question Newton's description of standard footwear and look forward to finding additional sources to illuminate this subject. As I have only dabbled a tiny bit in sewing leather, and because I am at this point uncertain of the exact design for the proper shoe, I have not yet attempted to recreate the zoccoli of the Venetian patrician. In the future I hope to either attempt this or to commission its creation. I also hope to design and produce the flexible boots worn by the young man in the Arrival of the English Ambassadors, as I think these will be ideal shoes for the fencing field. 1. Stella Mary Newton, The Dress of the Venetians, 1495-1525 (Aldershot, England: Scolar Press, 1988), 128. 5. Caroline Johnson, The King's Servants: Men's Dress at the Accession of Henry VIII (United Kingdom: Fat Goose Press Ltd, 2009) 16. 6. Michael de Lacy, Patterns for 16th century Men's Costume from Germany, http://www.insulaedraconis.org/documents/FlamePeace/AOP_new/wukpatterns.htm (accessed March 18, 2011).